← In and around Ubud. We have been spending some time in Pemuteran on the north west coast of Bali. I meant to post this a few days ago, but the internet connectivity was not up to it. Going from Ubud to Pemuteran, we spent the bulk of the day travelling over the peak of the island. Even the main road is narrow and winding, and full of people on scooters. It was a slow and relaxed kind of trip. It was pretty to drive through. We passed lots of terraced fields, villages and rainforest. The mountains here are not especially high, but they are very steep, and cut by deep gorges. Along the way, we stopped at Sengak monkey temple for the boys to have a look. Balinese temples are fairly open with lots of courtyards. There were tall trees growing all around the temple, and in places, up through the courtyard and walls. It was very picturesque, with a ‘lost temple’ feel to it. The guide told us there were six hundred macaques living there. He carried a small pouch filled with leaves for them to eat. If they got to be too much, he also carried a small slingshot. They were pretty cute and funny. They would jump up onto our shoulders and heads to be fed. We were surprised to notice that they smelled a lot like horses. We had lots of fun there. After leaving the monkey temple, we went over the heights of the island. The clouds covered the mountain tops. There was a lot of jungle. In the middle of the central mountains are several large shallow lakes. 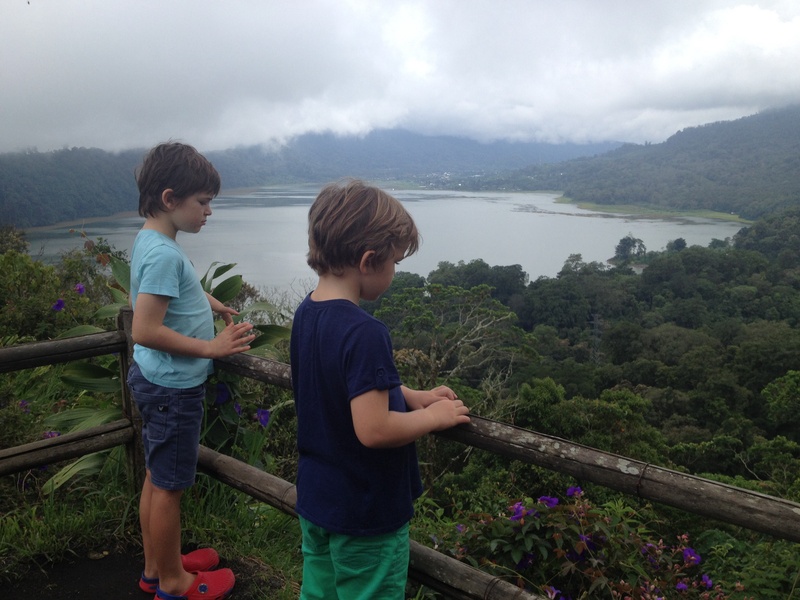 We took a break to look out over Lake Tamblingam and Lake Buyan. After a rest, we wound our down the other side to Pemuteran. Pemuteran lies on a thin strip of beach on a shallow, very protected bay. There are lots of reefs around here, including an artificial one. There is also a program, which we haven’t explored yet, for protecting turtle nesting sites in the area. Steep hills and cliffs lie just behind the beach. It looks like the sea used to wash against them, slowly eroding them into the thin, flat strip of land we see today. I wonder what will be here a hundred years from now. A sea level rise of half a metre would see the waves lapping at the base of the cliffs again. Unusually for us, we are spending our time here at a resort. It is very expensive by local standards. We are living in the archetypal tropical island paradise so often fantasised about in popular imagery. The immaculate lawn outside our air conditioned villa is covered each day in a spray of freshly fallen frangipani flowers. 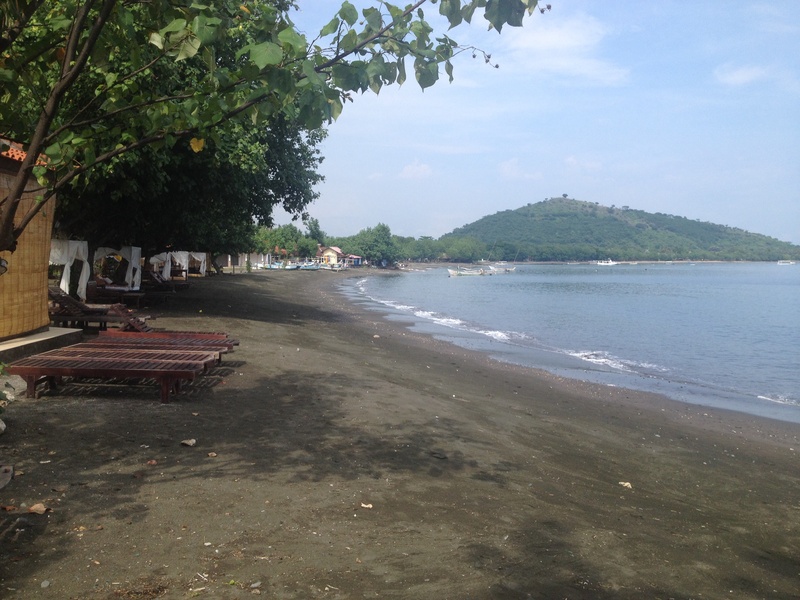 Walking down a well maintained path, I can sit at the bar next to the pool, and gaze down the black volcanic sands of the beach. In front of me, traditional style outrigger canoes ply the reefs of the Flores Sea. Behind me, jungle clad hills reach to the sky, swathed in cloud. Delightful as all of this is, it is a jarringly unlike what I see when I set foot outside the gate. Pemuteran is a noticeably poorer area than Ubud. The straight road into town is uncommonly broad with fast moving traffic. There is a constant need to walk in the stinking mud on the side to get anywhere. It leads past a number of tumbledown concrete and bamboo compounds. They are full of dirt, rubbish, and rangy chooks. My wife watched some people slaughter a pig in an amateurish kind of fashion in their yard today. Such a stark contrast is a strangely dissatisfying experience. I am not sure how I feel about it. 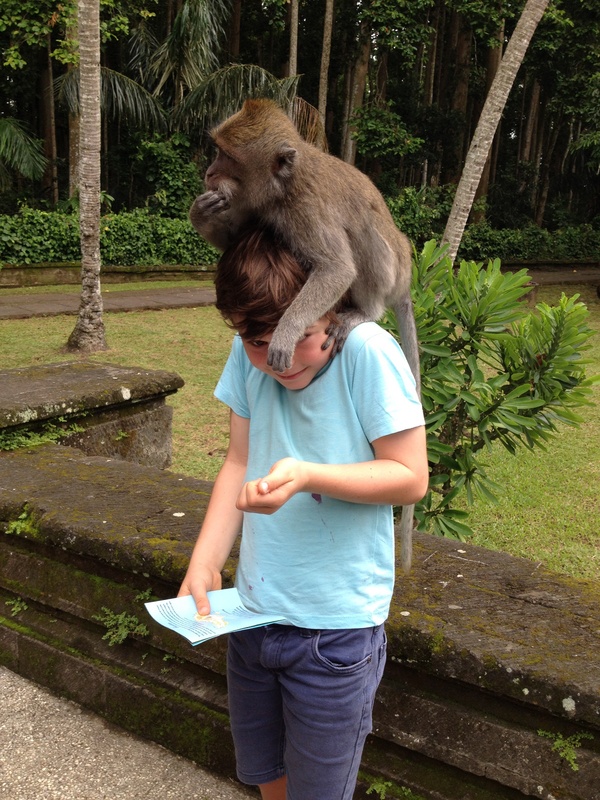 This entry was posted in Geography, Life experiences, Nature and tagged bali, bloke, homeschool, learning in context, life experience, nature, Pemuteran, travel. Bookmark the permalink. I felt the same way when we went to the Dominican Republic. It was tough to enjoy the beauty around me when outside the gates, there where shacks (boxes) where people lived. Agreed. Lucky, may be the only word fitting. Yes, the difference between the physicality of the place, and the lifestyle of the people who live there is really something. We all certainly now have a renewed appreciation for how good our life is. What an adventure! The monkeys sound fun. Watching a pig get slaughtered, not so much. I know it is tough for us to see the really poor areas here in Peru. It certainly can be confronting. In a sense, I find it quite a driver not to waste the priveledge and opportunity which has fallen into my lap by virtue of being born in the right place.